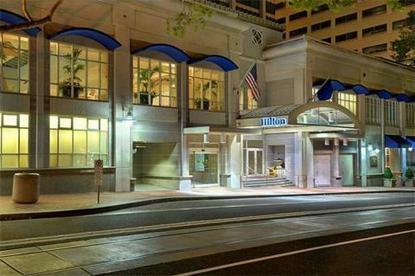 The Hilton Portland & Executive Tower hotel is located in the heart of Portland, Oregon's city center and only a block away from the MAX Light Rail system providing access to many of Portland's premier attractions. MAX also provides transportation to and from the Portland International Airport in just 30 minutes as well as to surrounding cities.Once you arrive at the Hilton Portland & Executive Tower hotel, we hope that you will notice our efforts as a leader in sustainability, but if you don't, that is ok because ''green'' doesn't mean a different guest experience, just a friendlier experience. As of 2007, we are proud to be the largest Green Seal Certified hotel on the West Coast. To earn this prestigious certification, we must adhere to rigorous environmental leadership standards and participate in sustainability programs such as recycling, waste minimization, reduced energy use and green purchasing.The Hilton Portland & Executive Tower hotel consists of two separate buildings and combined offers 782 guest rooms, 66,000 square feet of meeting space and two restaurants. In addition to that:The Main Building built in 1963 and recently remodeled in 2006 offers: Bistro 921 Restaurant & Bar - where you can enjoy classic American fare, Full-service business center - staffed Mon-Fri and 24-hour access with room key, Concierge desk, Hilton Athletic Club - offering an indoor pool, Jacuzzi extensive cardiovascular equipment, free weights, sauna and steam room, tanning, personal fitness training and massage servicesThe Executive Tower, added in 2002, showcases: Porto Terra Tuscan Grill & Bar, 24-hour fitness center with an indoor waveless lap pool, 24-hour self-serve business center.Once you have experienced everything the Hilton Portland & Executive Tower hotel has to offer, you won't want to miss our local attractions: Rose Garden Arena - Home of the Portland Trailblazers basketball team, Oregon Zoo - with over 1,000 mammals, birds & reptiles as well as the Washington Park & Zoo Railway, Oregon Museum of Science & Industry - providing hours of entertainment for the young and young at heart with an IMAX theater, laser light shows, tours of the USS Blueback submarine and much more, Tax free shopping at Saks Fifth Avenue, Nike Town, Nordstrom, Macy's and many others, Portland Art Museum - featuring many artists as well as traveling exhibitions, Oregon Historical Society - with over 85,000 artifacts, Portland Classical Chinese Garden, The annual Rose Festival Parade in June, The Willamette Valley Wineries.With so much to offer to both our business and leisure traveler, we are certain you will find the Hilton Portland & Executive Tower hotel your best choice as a home away from home.Travel should take you places.